What's your favorite color? Mine happens to be blue and so is this product I'm reviewing today. 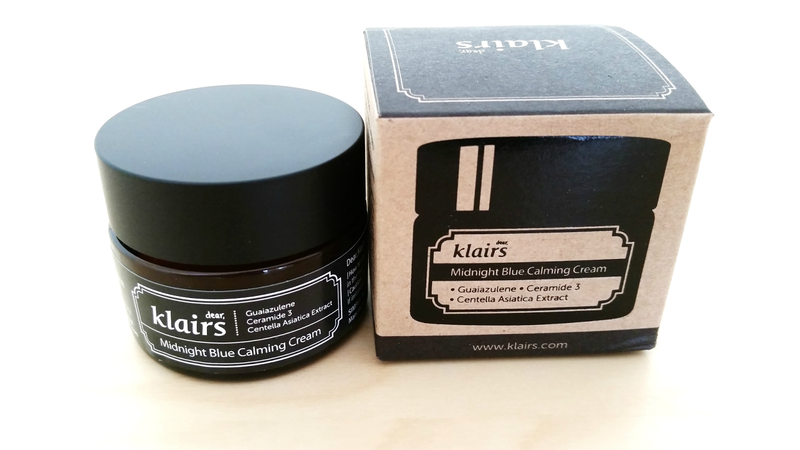 This is the Klairs Midnight Blue Calming Cream. 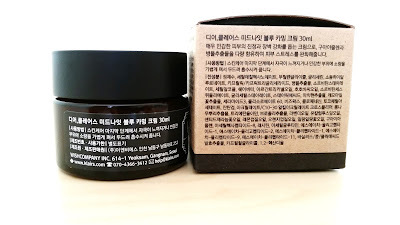 I was attracted to this cream due to multiple reasons but the main reason was its promise to calm and soothe sensitive skin when it's irritated. As someone with sensitive skin, this sounded like a great potential. 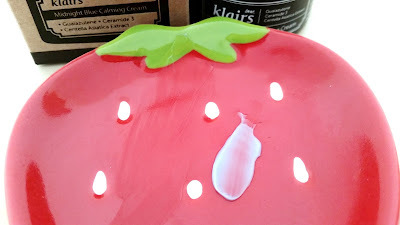 I've been testing this cream for 3 weeks now and I'm ready to share about it with you all. 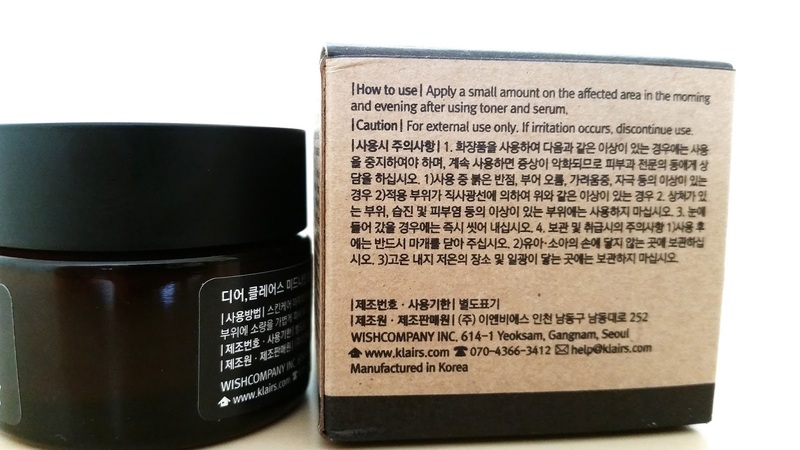 Product Description: A calming and comforting blue cream that helps to strengthen skin barriers. It can soothing the skin and provide intense hydration as well. It's formulated with guaiazulene, centella asiatica extract, and more to relieve damaged skin from stress and stimulation. To Use: Apply a small amount on the sensitive area in the morning and evening after using toner, serum and moisturizer. Use the cream as the last step of your skincare routine. If you use this cream in the morning before makeup, make sure to let the cream absorb well. Makeup can pill if the cream isn't fully absorbed. It's suggested to use the cream after pore care, intensive treatment/care, after long term sun exposure, or after shaving. Ingredients: Water, Cetyl Ethylhexanoate, Butylene Glycol, Glycerin, Sodium Hyaluronate, Caprylic/Capric , Triglyceride, Centella Asiatica Extract, Sorbitan Stearate, Cetyl Alcohol, Butyrospermum Parkii (Shea Butter), Argania Spinosa Kernel Oil, Simmondsia Chinensis (Jojoba) Seed Oil, Sorbitan Sesquioleate, Glyceryl Stearate, Stearic Acid, Portulaca Oleracea Extract, Anthemis Nobilis Flower Extract, Ceramide 3, Polysorbate 60, Bees Wax, Chlorphenesin, Tocopheryl Acetate, Xanthan Gum, Acrylates/C10-30 Alkyl, Acrylate Crosspolymer, Morus Alba Root Extract, Triethanolamine , Brassica Oleracea Italica (Broccoli) Extract, Lavandula Angustifolia (Lavender) Oil, Eucalyptus Globulus Leaf Oil, Pelargonium Graveolens Flower Oil, Citrus Limon (Lemon) Peel Oil, Citrus Aurantium Dulcis (Orange) Peel Oil, Cananga Odorata Flower Oil, Guaiazulene, Acetyl Hexapeptide-8, Lecithin, Acetyl Glutamine, SH-Oligopeptide-1, SH-Oligopeptide-2, SH-Polypeptide-1, SH-Polypeptide-9, SH-Polypeptide-11, Bacillus/Soybean/Folic Acid Ferment Extract, Caprylyl Glycol, 1,2-Hexanediol. Guaiazulene: This herbal ingredient is extracted from Chamomile which has a natural deep purple color. That color contributes to the cream's blue color. The ingredient can soothe and cool down inflammation on damaged skin. It can also help with skin regeneration. Centella Asiatica Extract: An extract from a plant originated in Madagascar, also known as the 'Tiger Grass'. This extract can help to regenerate damaged skin and prevent scars. Other notable ingredients are Sodium Hyaluronate, Ceramide 3, Butyrospermum, Parkii (Shea Butter), Argania Spinosa Kernel Oil, and Simmondsia Chinensis (Jojoba) Seed Oil. A couple of ingredients came up via CosDNA as potential irritants or acne triggers. Their ratings are on the low side and generally the lower the number the less likely it is to cause issues. Butylene Glycol has a potential acne trigger of 1. Sorbitan Stearate has a potential irritant of 1. Cetyl Alcohol has a potential acne trigger of 2 and a potential irritant of 2 as well. Jojoba Seed oil has a potential acne trigger of 2 and a potential irritant of 0-2. Stearic Acid has a potential acne trigger of 2. Bees Wax has a potential acne trigger of 0-2 and potential irritant of 0-2. Triethanol amine has a potential acne trigger of 2. 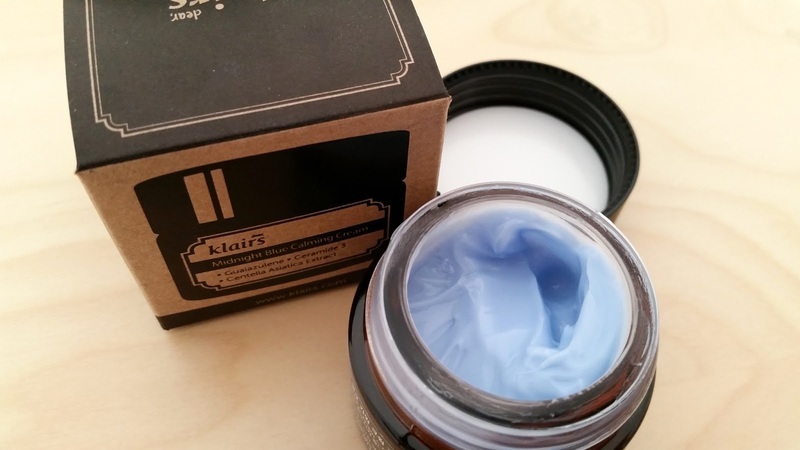 Packaging: The packaging is similar to other products from Klairs. I like it. It's clean and to the point. It offers a lot of information in both English and Korean. The container is dark, so when you twist off the lid the blue cream really pops. The cream comes with a handy spatula as well. The manufacturing and expiration dates can be found on the bottom of the container. Scent: The cream has a light herbal scent with a hint of floral. It's nice. Color: Well, the cream is blue in color. It's like a light sky blue and light violet mix. It's really pretty. 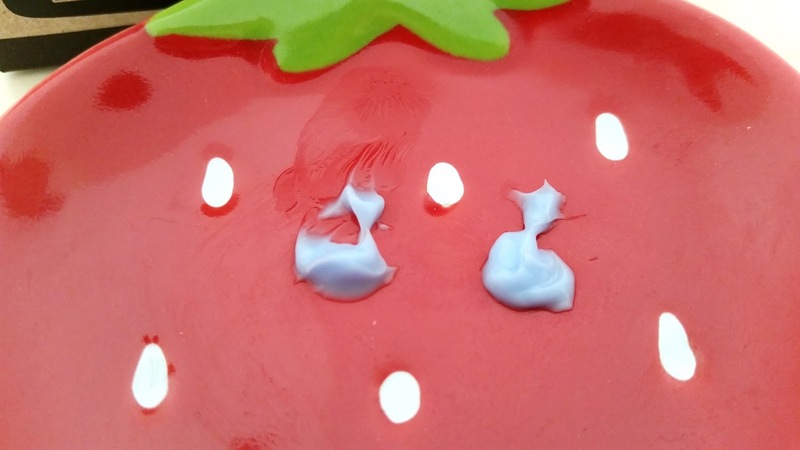 Despite its blue color, the cream does not make the face blue when you apply it. Texture: The cream is not too thick nor too thin. It feels silky and it spreads easily. The cream absorbs fairly quickly too. My Thoughts: I was really excited to test this cream. I've been testing this cream for 3 weeks now and I have a love-hate relationship with it. Before I get to why, let's talk about my patch testing period. I was a little worried about the ingredients that raised potential flags as potential acne triggers or irritants. 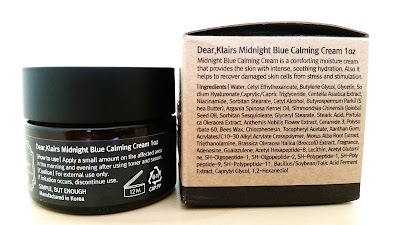 I was surprised to find so many potential red flags even though this cream is made for those with sensitive skin like myself. Still, I went forward with the patch test and learned several things. The patch test went smoothly for the most part with just one little hiccup. 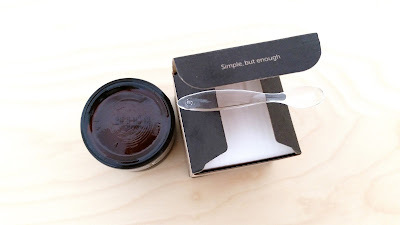 A little goes a long way for this product and applying just a little bit more might be too much for some. I found that when I applied just a little too much, the cream can cause my skin to produce excess sebum. Especially on my oily T-zone. It can be hard to determine how much is too much, so I just apply a tiny bit each time and build up if needed. Patch tests also revealed that the cream is not moisturizing enough on its own. The cream is made for calming rather than moisturizing, so I guess it makes sense. I found it best to apply a moisturizer before applying the cream. That way, my skin can be moisturized by the moisturizer while soothed by the Midnight Blue Calming Cream. I thought about testing the Midnight Blue Calming Cream over my entire face and ended up only doing it once. It seems this cream is best used as a spot treatment instead of a full face treatment. Plus, I'd go through the cream like mad if I use it on my entire face everyday. While the cream can be used both mornings and nights, I prefer to use it in the evening. I would say the cream feels soothing when applied but it doesn't help that much with healing irritations. When I apply the cream to an irritated spot, it seems to stop the itchy feelings and help the area feel soothed. However, when I look at the area, it still looks red and irritated. So while I felt relief, visually it wasn't doing much. The irritated areas still takes the regular amount of time to heal. I thought the cream would help to speed up the healing process of irritated skin but it doesn't. The cream does seem to prevent the irritated areas from getting any worse and it takes away the itchy feelings I might get. Still, I seem to lean toward the love side of the love-hate relationship. I reach for this cream often as a spot treatment. While it doesn't really help to speed up the healing process, it does stop irritations like itchyness. So the cream does help in certain areas. Final Thoughts: I do like this cream but there are certain aspects of it that makes me not like it so much. Hence the love-hate relationship. I feel like I would have liked this cream more if it doesn't cause excess sebum for me. Even when I'm careful, sometimes it can just be a bit too much. It also doesn't seem to help much with healing the irritated areas. Still, I find myself reaching for this cream when my face needs a bit of soothing care. So, it must be doing something right. Would I purchase it in the future? That's still debatable. I might if I don't find anything better but I'm still undecided on this one. Do I think this is worth a try? Well, if you are looking for a spot cream that can soothe and calm irritated areas then this cream might be worth a try. I have read a lot of reviews of this cream recently, and honestly, it doesn't sound like it does much more than, say, the Holika Holika 99% Aloe Lotion, which costs the fraction of the price and can even help irritated skin LOOK less irritated (or wounded skin, for that metter; I used it on a second degree burn on my hand a few months ago, and I was amazed by how quickly such a bad wound healed.) I know Wishtrend has been heavily marketing this product, but it sounds pretty meh... Thanks for the honest review!